SSC CGL 2019 Notification Released on ssc.nic.in / SSC Combined Graduate Level Examination-2018; Check Direct Link, dates, eligibility and more below: The official notification for Combined Graduate Level Examination 2018 has been released by the Staff Selection Commission, SSC on May 5, 2018. Candidates interested in applying for the CGL Examination 2019 for recruitment at various departmental positions are advised to check the official website ssc.nic.in and go through the notification carefully and only then proceed to the application on online.ssc.nic.in. Staff Selection Commission will hold the Combined Graduate Level Examination, 2019 for filling up various Group B and Group C posts in various Ministries/ Departments/ Organisations. Staff Selection Commission (SSC) will release the notification for its Combined Graduate level (CGL) exam 2018 on May 5, 2019 . The application process will also begin on May 5 and conclude on June 4. The SSC CGL 2018 exam will be held between June 4 to 19, 2019. SSC CGL Posts: Considering the previous years’ trends of SSC CGL exams here are the important things you can expect in the notification. Staff Selection Commission holds the Combined Graduate Level Examination, for filling up Group “B” and Group “C” posts in various Ministries/ Departments/ Organizations in the Government of India. 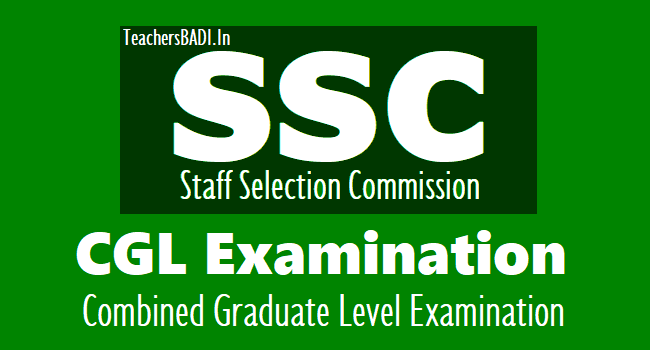 In SSC CGL 2017 notification posts included Assistant Audit Officer Assistant Accounts Officer Assistant Section Office, inspector, sub- inspector, income tax inspector, auditor, tax assistant, upper division clerk etc. SSC CGL Exam Pattern: The Tier-I of CGL Examination in Computer Based Mode.The tier II of SSC CGL is descriptive paper in pen paper mode. 1. Assistant Audit Officer/ Assistant Accounts Officer: Bachelors Degree. Chartered Accountant or cost & Management Accountant or Company Secretary or Masters in Commerce or Masters in Business Studies or Masters in Business Administration (Finance) or Masters in Business Economics. 2. Junior Statistical Officer: Bachelors Degree in any subject with at least 60% Marks in Mathematics at 12th standard level. Or Bachelors Degree in any subject with Statistics as one of the subjects at degree level. 3. All other Posts: Bachelor‟s Degree from a recognized University or equivalent. the SSC CGL Tier 2 examination is to be conducted in November. The candidates who wish to apply for SSC CGL examination must have a bachelor’s degree from a recognized university or institution. Also, the candidates who are in the final year of graduation can also appear in the examination. The candidate should be of Indian Nationality. The candidates will have to fill the application and pay the fee online. The minimum age limit is 20 years and the maximum age is 27. SSC CGL Selection Process: The examination is conducted in four tiers. Tier 1 and Tier 2 examination is conducted in online mode and the question paper is comprised of objective type questions (MCQs). Tier 3 examination is in descriptive format and the students have the choice for selecting English/ Hindi as a medium to attempt. Tier 4, again, is a computer-based proficiency test. The students who are able to qualify in the Tier-1 examination will get a chance to appear in the Tier-2 and 3 examination. Tier-4 examination is a skill-based test to be given only for some specific jobs like stenographer positions which require typing skills. AP: Guntur, Kurnool, Rajahmundry, Tirupati, Vishakhapatnam, Vijaywada. Staff Selection Commission (SSC) will release the notification for its Combined Graduate level (CGL) exam 2018 on May 5, 2019 . The application process will also begin on May 5 and conclude on June 4. The SSC CGL 2018 exam will be held between June 4 to 19, 2019. Last Date for application: 04.06.2019. Date of Computer Based Examination (Tier-I): 04.06.2019 to 19.06.2019 (Tier I). Date of Tier-II: 11.09.2019 to 13.09.2019.